Seventeen centuries after St. Paul journeyed across Greece, a solitary man of God travelled the same country from border to border, sea to sea, and island to island in a magnificent religious spirit, which strengthened the fires of Christianity and the flickering hopes of a nation, that was straining under the yoke of Turkish occupation after nearly four centuries of brutality. This rare specimen of Hellenic Christianity was a man, named Kosmas, a man whose devotion to God and country brought about a resurgence of the Christian Spirit of Greece and anticipated the revolution which was to cleanse the proud country with which it had long been infested by the oppression of the adversaries. Hence, his supreme importance in the moral and religious awakening of his country played an important role during the second half of the eighteen century. 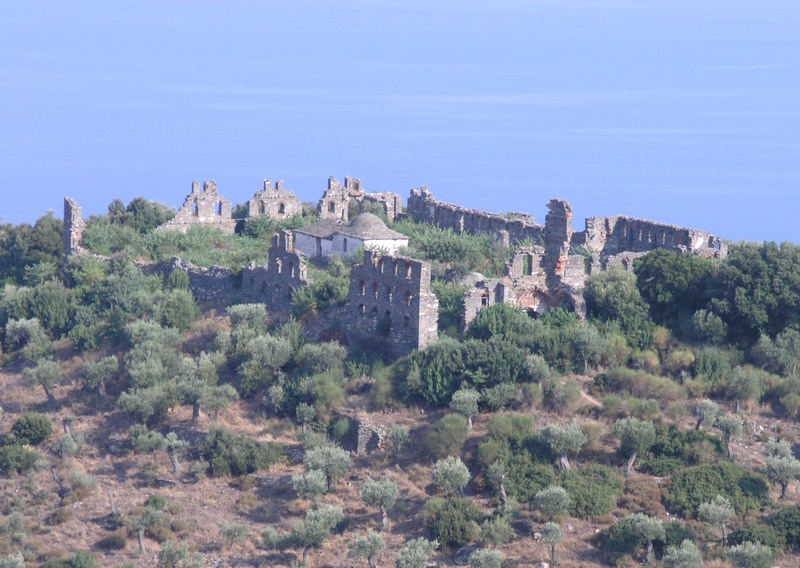 In the year 1749, Kosmas had enrolled in the theological academy of Mount Athos to further enhance his theological studies. 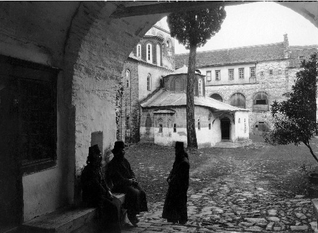 After a long period of monastic living, he was called to the spiritual needs of the world, however he did not forsake his monastic routine from the monastery, he was to transfer it in the world: ‘a monk does not deny his ministry and calling to the world when it demands the salvation of others.’ For this reason many ascetics and monastic’s ended up becoming bishops throughout Christianity as St. Kosmas once said: ‘let Christ lose one of his sheep in order to save many others.’ After a long period of monastic living, he was called to the spiritual needs of the world, however he did not forsake his monastic routine from the monastery, he was to transfer it in the world. O my brethren, don’t be sad for the dead, but if you love them, do everything you can for their souls: liturgies, memorial services, fasting, prayers and alms. All of you women who are wearing dirty clothes because of your dead, take them off because you harm yourselves and your dead. It is natural for a person to be born and die. We should cry when we are born and rejoice when we die. St. Kosmas’ preaching was exceedingly effective, it brought about an immediate and profound inner transformation to the hearts of his listeners: ‘among the factors contributing to Kosmas’ enormous success as a preacher were his humility and his identification with the people among whom he moved and worked.’ As a preacher St. Kosmas spoke on a level that was simple and coherent for the people to comprehend, taking illustrations from the experiences and surroundings with which the people were familiar. The austerity of his character and the evangelical simplicity of his words brought about an inspiration and feeling of hope to many families. For this reason the Greek nation was to experience a spiritual revival led by the itinerant preaching of St. Kosmas. If by chance you want to be saved, don’t ask for anything else in this world except for love. If there is anyone here among your nobility who has this love for his brethren, let them stand up and tell me. St. Kosmas believed that love was indispensable for the nurturing and communion of the people. He would urge the people to embrace and love one another like one of their own children: ‘if you wish to be saved you should love all the Christians as your children.’ Love by its nature is a resemblance of God, therefore in light of the above he who loves the Lord has first loved his brother, for the latter is the proof of the former. I as an unworthy servant of God, my fellow Christians…I have come to your village and seeing that you have no school for your children to learn without paying, I urged the Christians and they gave according to their ability and will for the school…I beseech the Lord who blesses all things to bless your village, your school and your children and to find you worthy to live well. I appointed with consent…Mr Spyrou Athanasiou to govern the school as the Lord enlightens them. Hieromonk Kosmas who prays for you. Moreover, St. Kosmas encouraged other ethnic communities to learn to speak the Greek language in order to understand the church services i.e. liturgy, baptisms and weddings: ‘he encouraged Albanian speaking communities to adopt Greek…they were prodded to learn Greek because of the church’s services were conducted in it and because the Gospel itself had been written in this language.’ Thus, it becomes clear the effort of his missionary work was in more ways than one a major impact to the nation. Another aspect of his missionary work involved giving to the poor alms and distributing many items that were of spiritual benefit for the soul of the people: ‘he gave away books by the church fathers, baptismal basins, prayer ropes and little crosses to the Christians.’ For this reason St. Kosmas’ invaluable and fundamental contribution to education through his missionary work had caused the Greek people to regard him as a national saint and a teacher of a nation. From the above it is clear that Kosmas was referring to the fighter jets, employed during various wars throughout the centuries. Kosmas firmly preached on numerous accounts concerning the Antichrist and prophesised the independence of Greece from the hands of the Turks (τουρκοκρατεία): ‘he spoke often of Antichrist and the end of the world and predicted the freedom of Greece within three generations of the one then living.’ His prophecies in this regard stirred up the hopes of Greece and were one of the major factors that caused them to intensify their efforts at achieving Greece’s liberty and providing a glorious future. Moreover another of his prophecies concerns the reappearance of Elijah the prophet who had not encountered death during his lifetime, accordingly this prophecy led many people to a state of repentance: ‘prophet Elijah had kept hidden, but alive by God for so many centuries, but was about to resurface to preside over the last phase of history.’ Kosmas brought a huge impact on the national and spiritual consciousness of the Greek people, they themselves saw in him a prophet and champion of their freedom. For this reason through Kosmas’ mystagogical lifestyle he became a dwelling place of God and through his pure intellect he was able to foresee the future as the present. On 24 August 1779, Kosmas was to meet his death through the hands of the Turkish governor named Kurt Pasha. Kosmas had been imprisoned for his confession of faith for the one, Holy and apostolic church and was eventually hanged, his body was disposed by being thrown naked into a local river. Three days later his body was found by a certain priest named Fr. Markos and ever since his holy relics have been the result of many miracles. 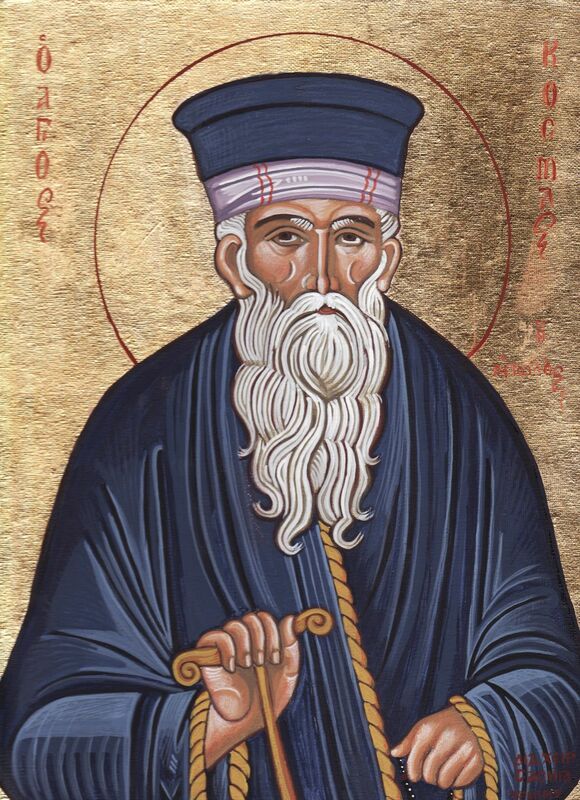 As a man of many gifts, a monk, priest, preacher, missionary, prophet, isapostolos, elder, martyr, pioneer and saint, it is evident that the life and works of St. Kosmas were a beacon not only for his com-patriots, but for the entire world. His influence on tradition, faith and culture has been an inspiration to many to this present day. Having come to grips with the challenges of everyday life, he was convinced that he had to teach by example, carrying his own cross in the world in order to show us how to do the same. He adopted our concerns as his own and help reinforce the identity of the Greek people by in-scripting the tradition and faith into the spirit of a tormented nation. 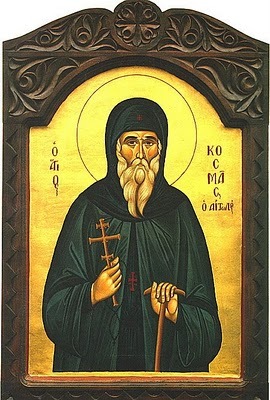 Hence, St. Kosmas has undeniably been recognized as one of the greatest Christian and national figures of post Byzantium. Cavarnos, Constantine. ‘Modern Orthodox Saints’ (series): St Kosmas Aitolos, Belmont 1971. Cavarnos, Constantine. ‘St. Cosmas Aitolos’. St. Vladimir’s Seminary Quarterly 4 (1966): 189-194. Lampe, G.W.H. A Patristic Greek Lexicon. Oxford: Oxford University Press & Clarendon Press, 1961. 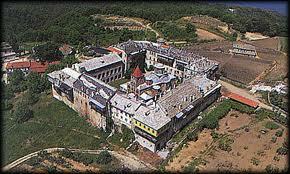 Nicozisin, G. The Orthodox Church: A Well kept secret. A Journey through Church History, 1998. Papadopoulos L.J. & Lizardos G. (transl. ), New Martyrs of the Turkish Yoke, Seattle 1985. Parry, K. et al. The Blackwell Dictionary of Eastern Christianity. Massachusetts: Blackwell Publishers, 1999. Σαρδέλη Κόστα, Ο Προφήτης του Γένους: Κοσμάς ο Αιτολός. Aθήναι: Αστήρ, 1980. Scourtis, Constantina. ‘St Kosmas the Aetolian’. In Encyclopedia of Greece and the Hellinic Tradition. Edited by Graham Speake. London: Fitzroy Dearborn Publishers, 2000. Stylianos, Archbishop. Unpublished Lecture Notes, 2009. Vallianos, S. Pericles. ‘St. Kosmas Aitolos: faith as Practical Commitment’. The Greek Orthodox Theological Review 2 (1980): 172-185. Vaporis, Michael. Father Kosmas: The Apostle of the Poor. Brookline, MA: Holy Cross Orthodox Press, 1977. Ware, T. Eustratios Argenti: A Study of the Greek Church under Turkish Rule. CA: Eastern Orthodox Books, 1974. Michael Vaporis, Father Kosmas: The Apostle of the Poor (Brookline, MA: Holy Cross Orthodox Press, 1977), 4. Ibid., Third Didache, p. 54. Κόστα Σαρδέλη, Ο Προφήτης του Γένους: Κοσμάς ο Αιτολός (Aθήναι: Αστήρ, 1980), 120. Constantine Carvanos, ‘St. Cosmas Aitolos’, St. Vladimir’s Seminary Quarterly 4 (1966): 189. G.W.H. Lampe, ‘Ισαπόστολος’, in a Patristic Greek Lexicon (Oxford: Oxford University Press & Clarendon Press, 1961), 676. Constantina Scourtis, ‘St Kosmas the Aetolian’, in Encyclopedia of Greece and the Hellinic Tradition, ed. Graham Speake (London: Fitzroy Dearborn Publishers, 2000), 910-911. Michael Vaporis, ‘Father Kosmas and the Gospel of Love’, The Greek Orthodox Theological Review 2 (1980): 166. Lampe, op. cit. (Note 5), 365. Vaporis., Fourth Didache, p. 69. Scourtis., op.cit. (Note 8), 910. Vaporis., op. cit. (Note 1), 7. Vaporis., Eleventh Letter (Note 1), 156. Pericles, S. Vallianos, ‘St. Kosmas Aitolos: faith as Practical Commitment’, The Greek Orthodox Theological Review 2 (1980): 176. Carvanos, op. cit. (Note 3), 190. Κόστα Σαρδέλη, Ο Προφήτης του Γένους: Κοσμάς ο Αιτολός (Aθήναι: Αστήρ, 1980), 143. Vaporis, op. cit. (Note 1), 159-160. Scourtis, op. cit. (Note 8), 910-911. Vaporis., op. cit. (Note 1), 160. Archbishop Stylianos, Unpublished lecture Notes, Dogmatic Theology, 26-3-09. Pericles, S. Vallianos, ‘St. Kosmas Aitolos: faith as Practical Commitment’, The Greek Orthodox Theological Review 2 (1980): 172. Next: BOOK REVIEW:Vladimir Lossky, The Mystical Theology of the Eastern Church (Crestwood, NY: SVS Press, 1944), pp 7- 249. Thank you for this web page. Its very simply but spiritual. I am looking for St Kosmas Aitolos paraklesis or akathist in english. Could you direct me. Thank you. With regards to your enquiry, I have heard of the existence of an English Supplication Service (Parakleisis) to St Kosmas the Aetolian. However, I have unfortunately never seen it. As for an Akthist Hymn to him, from what I know, I do not believe it exists. It is interesting to note that it was the Russians who began writing Akathist Hymns to various Saints, whereas in other Orthodox Christian Traditions, the only Akathist Hymns were those dedicated to the Virgin Mary, maybe one to Christ and to the Archangels, but beyond that very precious little. But coming back to you enquiry, there are a few places in Australia and the Oceania region whereby one can gain an English Supplication service to St Kosmas the Aetolian. Probably the first and most reliable supplier with good links to overseas publishers and suppliers is Crossroad Books in Melbourne. They can be found online and have an online catalogue. Their website at present is experiencing a few issues, but they are very diligent in sourcing Orthodox literature and other items like dvds, cds etc. Then there is Greek Orthodox Archdiocese Bookshop in Redfern (NSW), Christian Enosis in Newtown has also a very good selection of books and I remember they had quite a number of publications in English. Then there is the Orthodox Gift Shop that the Greek Orthodox Monastery of Geelong (Victoria) operates. There are of course many other suppliers, but they tend to be very small-scale, do not have the variety of books and resources, or they tend to cater in a specific ethnic language, like the bookstore at St Sava’s Serbian Orthodox monastery in Victoria which mainly supplies quality Orthodox literature in Serbian, or the parish bookstore of St Paul’s Antiohcian Orthodox parish in Dandenong which has predominately Arabic books, but it does have quite a number of English books. There’s Holy Ascension Mission in Melbourne which also has a very good supply of English language books. Otherwise, the alternative to all these and more locally based book suppliers, is to go online and search through the various suppliers of Orthodox books such as SVS Press or one of the various Orthodox monasteries in America and England. I know that of late, quite a number of monasteries in Greece are now translating, publishing and selling many works in English such as the ever popular life of St Paisios as written by Monk Isaac. One prime contact in Greece is Denise Harvey who is the widow of the late and beloved Philip Sherrard who will be best remembered for his efforts in helping to translate the Philokalia into English, apart from his many other writings which were a great blessing for English speaking Orthodox Christians. Anyway, I regret for not being much help in you search, but may God guide you to what you seek.